Embarrassing Moments. We’ve all got them…Here’s one of mine. I was 16. 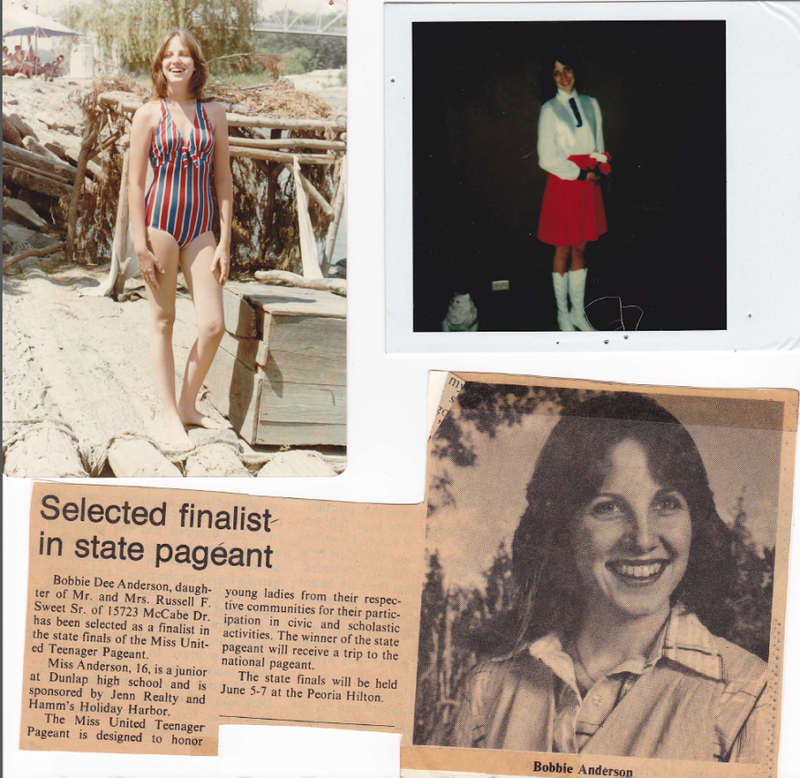 I was a contestant in a local teen pageant for the National trials of “Miss United Teenager”. My mother was ecstatic. She flew my Grannie and my Great Aunt Lucille up from Florida for the big event. Our boating friends, George and Lil who owned and ran the Henry News were sponsors. So were Hamm’s Holiday Harbor, and whatever the other place was in the article. I don’t remember that part. It’s not important for the story. So, we have to dress in Uniform, White Boots, Red, White and Blue outfits. We each wrote an essay about patriotic something. Who Knows. It’s the first night. Everyone is there. Guests have taken their reserved seats. The pageant starts. I’ve been practicing for 2 days, and they’re all there looking for their contestant. Trouble is, I was at the nearby Emergency Room. I remember after practice, just before the show was to begin, greeting my grandmother and my great aunt, and heading for the bathroom. My tummy was killing me. I walked out of the bathroom stall, promptly passed out cold on the cold tile floor. Someone called 911. The next thing I know I’m being lifted onto a gurney and placed into the back of an ambulance. I think I’m dying. Seriously, dying or Alien is attempting to exit my stomach. After IV’s, blood tests, CT Scans, etc., they discover I have a large Gas Bubble trapped in my intestines…causing the discomfort that made me pass out and miss opening night of the big to-do. The next day my mother, who is incensed and embarrassed, is telling me I have to go back and complete the competition. I am forever grateful for my Daddy Russ, who intervened at that point and said to me, “Sister, if you don’t want to do this, tell her NO.” I told Mama, No. Can’t Do It. Tummy Hurts. I learned two things here…. Girls can and should actually fart when necessary, and don’t let anyone push you into something you aren’t ready for. Previous Learning about the Rule of Thirds….